This time of year, when I walk outside to get the mail on a dark afternoon, I sometimes catch myself thinking that the front garden looks ugly. There’s not much in it right now except dead leaves of hostas and other perennials, which I should clean up but haven’t yet gotten around to doing, and some junipers and a yew that haven’t been trimmed in a while and are starting to look raggedy. 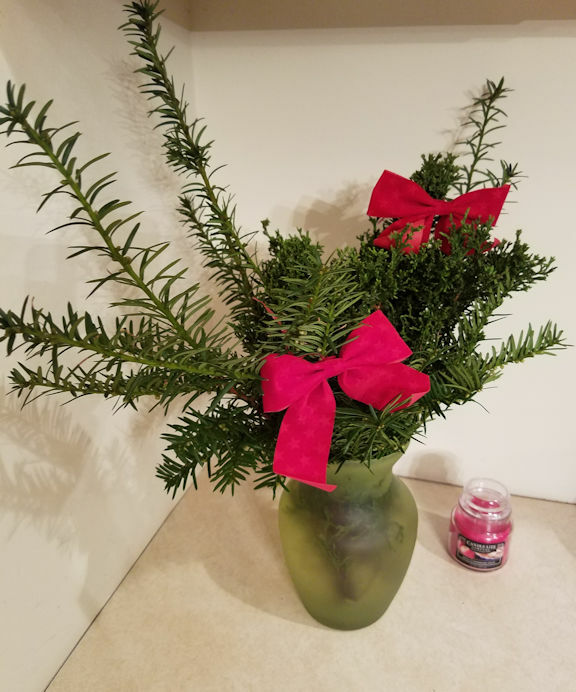 Soon enough, the days will get longer again, and the garden will bloom with new spring growth; but until that time comes, there’s no reason to settle for ugly. 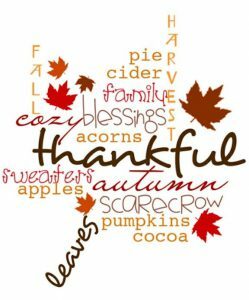 I chose a horn of plenty image for my Nurturing Thursday post because, right now, I have plenty of reasons to be thankful. All of my family are in reasonably good health and good spirits. 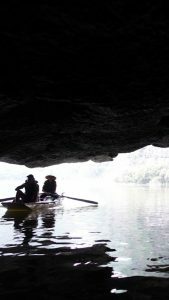 I had some fun adventures this year traveling to rowing regattas with my husband. Everything at work is going pretty well. Although I had a few unplanned expenses this year, such as having to replace my old refrigerator and air conditioner, anything that can be fixed with money is not really that much of a problem. Besides, I like the new refrigerator and air conditioner much better than the old ones. 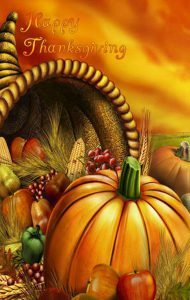 Wishing plenty of Thanksgiving blessings to all! My house is generally comfortable, but one issue it always had was that the closet in the master bedroom was cold all winter. Although that closet is on top of the garage, it didn’t seem as if it should have been so chilly—there is a register in the ceiling, but it never seemed like we got much warm air from it. For lack of better ideas, we put a space heater in the closet during the winter. When we replaced our air conditioner with a larger and more modern unit over the summer, we also had to start buying air filters in a larger size. We noticed that the air flow seemed better, but we didn’t think much about it. When the weather turned colder, we were surprised to discover that the closet in the master bedroom stayed nice and toasty. Apparently, all it needed was a better air filter to improve the flow. There’s a useful lesson in that. Even when annoying issues seem as if they’re going to be around forever, sometimes they’ll just vanish suddenly when other things get improved. I deliberated for a while on what sort of image I could add to this post to represent both cold and flow. I finally settled on this photo of people rowing in icy water. That is definitely not something I would ever do, regardless of how adventurous I might otherwise get in rowing! The people in the photo look like they’re enjoying it, though, so I would say it’s good flow for them—well, as long as their boat stays right side up, that is! 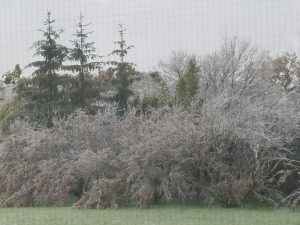 My poor long-suffering backyard willows, which I’ve had to cut back significantly in the past few years because of damage caused by unusually cold winters and hot, dry summers, took more abuse this morning when an ice storm bent their branches all the way to the ground. The temperature got above freezing this afternoon, though, and the ice is melting. 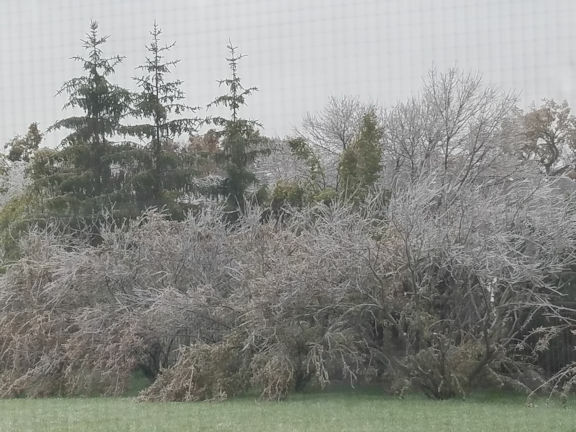 I expect that by tomorrow, the branches will have shed their coating of ice and will have bounced back, not much worse for the wear. We could learn a few things about resilience from their example! After spending so much time this year rowing with my husband and traveling to regattas, it feels sad to look outside and see frost on the grass in the morning, while the boats sit empty until warmer weather returns. But, on the other hand, it’s not realistic to be on the go forever. Although it would be nice to have unlimited energy for fun activities, sometimes what’s needed is to relax and not be in a rush. That left me considering how I might do a better job of balancing travel and adventures against the need to rest and replenish my energy. Even though this wasn’t something that happened long ago, I decided on Tuesday evening that a make-believe conversation in one of the tiny houses of Channelwood, the imaginary village where I send my stressed-out past selves for a restful vacation, could give me some insight. I pictured my half-asleep Monday morning self sitting on the bed next to me. The scenario reminded me of a dorm room because the only other place to sit was a desk chair. 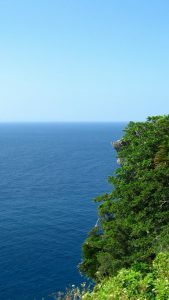 Outside a narrow window, a cliff fell sharply away to the ocean, and I heard the surf and seagulls clearly. I couldn’t manage to compose any useful dialogue, though. Monday-Morning-Before-Coffee-Me was not lucid enough to put more than a few words together, and just looked like she wanted to go back to sleep. And to be honest, I didn’t think of any good questions to ask her before I was dozing off too. It wasn’t a completely wasted exercise in imagination, though, because the idea of a dorm room left me dreaming that I was back in college. I wanted to eat a leisurely pancake breakfast in the cafeteria, but my husband (who was, of course, my boyfriend then) was telling me to hurry up and grab something quick. In real life, he generally doesn’t try to rush me when I am eating breakfast because he knows I hate that. So I interpreted the dream-image as referring not to him in particular, but to whatever might put me in a rush. As for the pancake breakfast in the cafeteria, I decided that was my subconscious mind’s advice for enjoying a more restful life; and I made banana pancakes with real maple syrup. Yum, that left me feeling better! 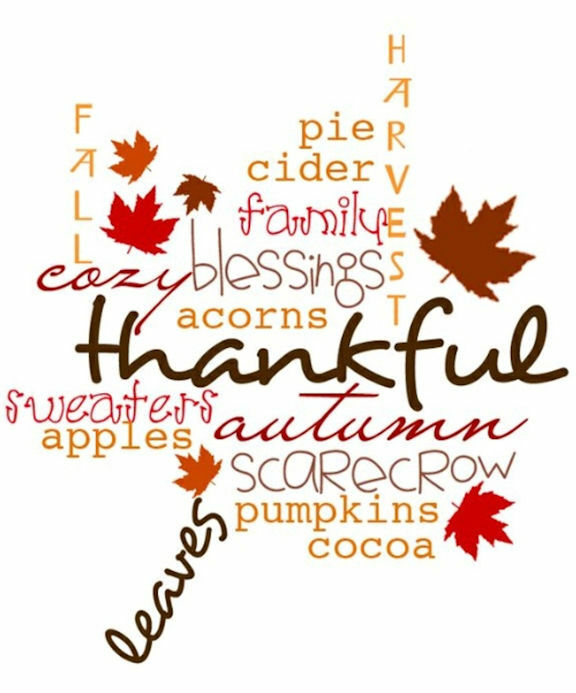 November in America traditionally is a time for reflecting on the many things for which we are thankful. In that respect, I was glad to see such strong participation, especially by younger voters, in Tuesday’s election. Although politics in the United States recently has been marked by cultural and generational clashes, I feel heartened that so many people are not giving up, but are actively working to bring the country together and to build a society where our differences are respected and valued. I have a good relaxing afternoon planned for Tuesday. After an ordinary morning of work, I’ll have my hair done in the early afternoon, and then I’m getting a massage. 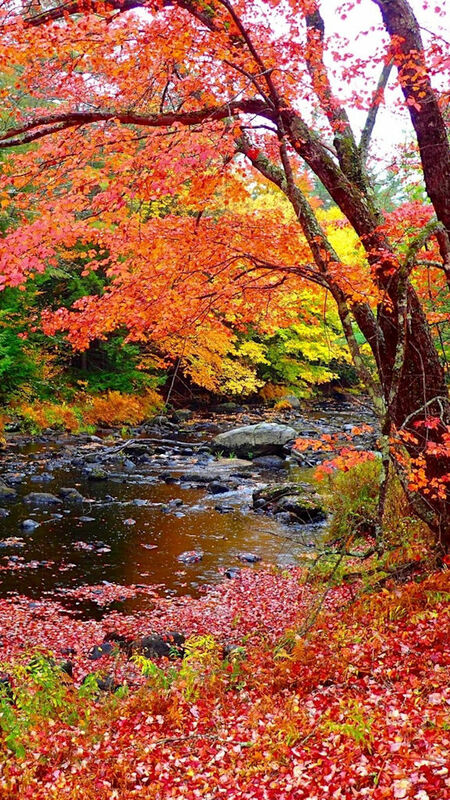 My digital art display shows a peaceful autumn scene. If all goes as planned, I should be nice and mellow by the time I vote later in the day. Unfortunately, some of today’s politicians are notorious for deliberately stirring up anger to motivate their supporters. That sort can be found in more than one political party, and I won’t mention any names because I have better things to do than give them attention. Anger and fear can be effective motivators for a short time, but they have predictable effects. After a few years, the stress builds up, leaving people drained of energy and unhealthy. Of course, the politicians who stirred up such feelings don’t care because they already got the votes they wanted, and they’re not looking beyond the current election cycle. Choosing public officials should involve considering the values and ideals that shape our society, and how each candidate would reflect them. Some of the values needed now, as I see it, are decency, civility, stable government, and respect for the rule of law. I plan to vote accordingly, without wasting time and energy on anger. Surely we can all do better. Because it has been dark and rainy here, I’m looking for bright colors and cheerful things to perk me up—and surely I’m not the only one feeling this way. 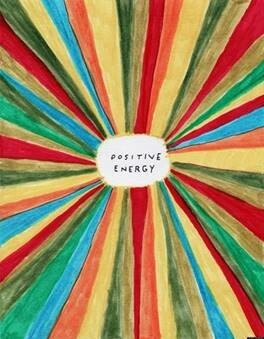 When a coworker sent this “positive energy” image in an email, it felt just right to share for Nurturing Thursday! Enjoy.